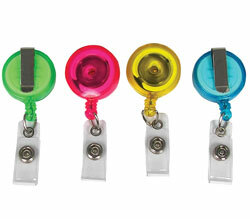 Plastic clip grips badge for easy attachment to lanyards, reels, etc. Eliminate the need for card punching. Plastic clip grips badge for easy attachment to lanyards, reels, etc. Black. 100/BX.